Quick! You've been invited to Thanksgiving dinner at a someone else's house and you want to bring something delicious that doesn't involve you crowding into the host's kitchen to use their precious stove burners or oven space. What do you do?! First: calm down. You've got this. Second: chat with the host and offer to bring something. Then check out these easy recipes that can be made before you go and need little more than a quick warm-up before dinner. 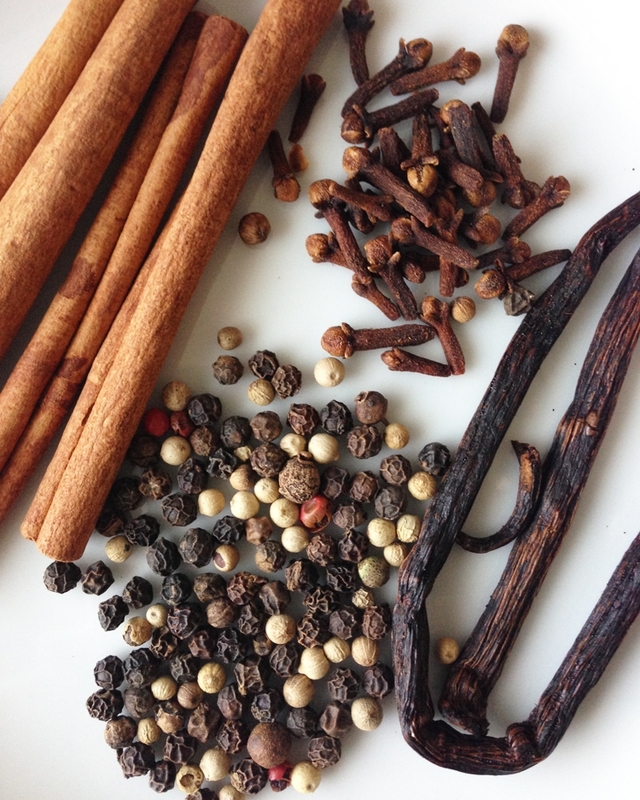 A few of the spices I like to use in mulled wine. I'm a huge fan of mulled wine during the holidays. It's warm, it smells amazing and everyone seems to enjoy it. That said, who has extra space on their stove to simmer a pot of wine on Thanksgiving? Not this girl. My stove top is usually full of pots and pans for various side dishes. If you've been invited to Thanksgiving at someone else's house, why not offer to bring mulled wine...in your crockpot? I know. It sounds crazy, but it works. I like to use this recipe as a guide, but I usually just add what I have (see: vanilla bean, cloves, cinnamon, peppercorns, oranges, etc.). You can make it ahead of time on the stove, and either transport it in the crockpot (if you're lucky enough to have those snazzy lid clamps on your crockpot) or you can bring it in a large container (like a giant mason jar) along with your crockpot to keep the mulled wine simmering on an appetizer table or drink station. So many choices! Ask your grocer to help you create the perfect cheese plate. This is my go-to option for pretty much any party. On Thanksgiving, hosts always appreciate a way to keep guests entertained while they're tucked away in the kitchen cooking a ridiculously large bird. Simply go to your nearest grocery store and head to the cheese section. I always chat up the staff member working in that section because 1.) they tend know more about cheese than I do and 2.) there's a very good chance they'll let me try a cheese before buying it and I'm not one to turn down free cheese. EVER. If you grab a varied selection, you should be on the right path. Again, talk to your grocer! They know stuff. I always add sliced salami (like these) and crackers (like these) to the mix because our family loves it. You could easily garnish yours with fruit, fruit spread or honey instead (like Eden does here). The beginnings of good turkey stock -- the perfect base for gravy. Prepare yourself. I'm about to tell you that it's okay to have someone bring the gravy to Thanksgiving. I know there will be Thanksgiving purists out there who will scoff at this, but who cares?! After spending all day prepping and cooking dinner, sometimes it's nice not to have to wait for fat to separate and deal with giblets. My mom always brings gravy when I host Thanksgiving dinner and I've never had any complaints. I'm returning the favor for my sister-in-law this year. We cooked a turkey last weekend (when we don't host the big day, we still like to get our turkey fix) and I made a variation of this crock pot turkey stock from the caracas. The day before Thanksgiving (this can also be done day of), I'll be using this recipe to make gravy (full disclosure: I haven't tried the recipe yet. Wish me luck.) and refrigerating it. Then I'll just bring it to the party in a huge container and we'll warm it up with in the turkey pan, along with the drippings. Done and done. The easiest and most delicious dinner rolls to bring to Thanksgiving. Dinner rolls always seem to be an afterthought in our family. I've attempted to make rolls for Thanksgiving in the past and failed miserably. I actually swore off making bread products because of those failed attempts. All that waiting and rising business...no thanks. So, we've always opted for store bought rolls that we could just warm up right before dinner. Since I'm also bringing the rolls this year, I decided to start looking around for a recipe just in case I could find something worth trying. I came across this recipe for fluffy dinner rolls and thought I'd give homemade rolls another chance. Before I made the turkey last weekend, I tested out the recipe and THE. ROLLS. WERE. AMAZING. The recipe is incredibly easy and it requires very little waiting and rising time. We have a winner, ladies and gentlemen. I'll be making these rolls right before we leave for Thanksgiving dinner and they'll still be warm when we get to our destination. Depending on the timing for dinner, we may need to warm them for a few minutes before serving. Easy peasy. Now I want to know: how does your family make Thanksgiving work? Do people bring dishes with them or does the host like to make the majority of the meal? I'd love to hear about your favorite side dishes or pre-dinner goodies to bring to the party!